You’re minding your own business when in walks a world famous celebrity like Eva Longoria or Rosario Dawson and out goes your composure. You can’t resist. You have to snap a picture, you must get her autograph, you blurt out something about how much you like her work. Whether it’s a movie or television actor, a rock star or sports figure, these bigger than life individuals have a way of flustering you. They can get you to do things you wouldn’t otherwise think of doing. Celebrities possess an uncanny ability to influence your consciousness and their influence sometimes extends into your pocketbook as well. The Hollywood elite are courted by Fortune 500 companies and advocacy groups to be spokespersons, raise funds, and even serve on their boards. This in turn increases public receptivity for products or causes, making celebrities a valued commodity. They’re given access to the moguls and the media barons with whom they hang out at Hollywood events, and with the cross pollination of Washington and Hollywood, they can influence multinational corporations and world leaders. Celebrities quickly learn they get a little extra light shining on them and many have used it to illuminate things close to their hearts. Increasingly, in addition to the charities Latino celebrities support, many have established their own charitable organizations. And it’s all for a good cause. Golden Globe nominee Eva Longoria supports over twenty charities including the Cesar Chavez Foundation, the Larry King Cardiac Foundation, the American Heart Association, UNICEF, United Way, Oprah’s Angel Network, the Make a Wish Foundation, and the National Center for Missing and Exploited Children. However, Eva has her own causes into which she pours her free time, energy and heart to make a difference in the Latino community. In 2006, she founded Eva’s Heroes, inspired by her older sister, Elizabeth, who was born with an intellectual disability. Eva’s Heroes is based in San Antonio and provides after-school programs for individuals with developmental disabilities. Eva also sits on the board of the Mexican American Legal Defense and Educational Fund (MALDEF) and works closely with the United Farm Workers, the Dolores Huerta Foundation, and the National Council of La Raza (NCLR). In addition, she was recently selected by former Speaker of the House Nancy Pelosi as an appointee to the National Museum of the American Latino Commission. This museum will create a home for the historical artifacts, images, and personal stories documenting over 500 years of Latino contributions to the United States. No wonder that in 2009, Eva was named The Hollywood Reporter’s Philanthropist of the Year for her dedication to social causes. She was the first Latina to have been given such an honor. But it is her work with the Los Angeles based PADRES Contra el Cancer that she is most recognized for. PADRES recently celebrated 25 years of helping to improve the quality of life for Latino children with cancer and their families. Eva began volunteering for PADRES in 2003, a year before she was cast in Desperate Housewives. After being asked to host the El Sueño de Esperanza Gala in 2004, she signed on as the organization spokesperson. That first year, her participation enabled PADRES to double their monetary donations and raise awareness of the organization. Enlisting her celebrity friends, Eva has been able to catapult PADRES into the Hollywood limelight and raise over $4 million since joining the organization.”My wish is for PADRES to become a nationally recognized organization attracting sponsors, donations and support from all communities, not only our own, to join in the battle against cancer. When these children see me on TV, I want them to know that there is an organization devoted just to them and that they have hopes,” says Eva. It’s that celebrity effect again. But what, exactly, do stars do for causes? They raise money, of course. But that is often less important than raising consciousness. That is what Wilmer Valderrama tries to do with the causes he supports. Wilmer focuses on education, U.S. troops, and political awareness. For Wilmer, who was born in Miami but went to live in Venezuela when he was only three, these are the causes that speak to him. He moved back to the U.S. when he was 13, and although he is an American citizen, he very much identifies with the experiences of the disenfranchised immigrant and the need to find their place in society. He is the national spokesperson for the Hispanic Heritage Foundation, which identifies, inspires, promotes and prepares Latino Leaders through national leadership, cultural, educational and workforce programs. And he recently renewed his partnership with Congressional Hispanic Caucus Institute’s Ready to Lead (R2L), a college readiness program that helps Latino high school students enter post-secondary education, as spokesperson through December 2012. “It’s become easy to get your voice heard and so easy to inspire people though all media outlets. That is our next agenda, how do we get the community to feel that they have that same opportunity,” says Wilmer. Even before playing a veteran in the film The Dry Land, Wilmer’s support for the U.S. military was well known. He had already made several trips with the USO to entertain the troops. “I went to nine countries back-to-back, and then I went to Iraq and Afghanistan, and now I’m a longtime member of the USO,” says Wilmer. “I brought my comedy show there, and the audience was just the most amazing audience to perform for, man. They were just hungry for entertainment and humor. “I was able to understand that with my career I had an opportunity make this an organic extension of what I can do. As entertainers we have the ability to convey, and raise awareness, since we are in touch with our fan base and understand what we need as a community,” says Wilmer. 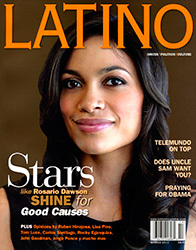 With all this involvement, it’s no surprise that in 2008 when Rosario Dawson, co-founder of Voto Latino, asked him to help direct PSAs for her organization, he quickly signed up. Here too, both Dawson and Wilmer tapped into their relationships with fellow Latino celebs to get them to appear in the PSA’s. The exotically stunning actress Rosario Dawson is a bonafide movie star, a powerhouse talent whose list of film credits include Sin City, Men in Black II and Seven Pounds, in which she starred opposite Will Smith. In her most recent film, 20th Century’s Unstoppable, she appears with Denzel Washington. A self-described actress/producer/philanthropist, Rosario chose the Lower East Side Girls Club as one of her first causes to support. It hit close to home, literally. The club is located in the neighborhood where she grew up. Rosario’s involvement with charities is always very personal. The charities she has chosen to support include Global Cool, a green lifestyle organization; ONE Campaign, a grassroots campaign committed to the fight against extreme poverty and preventable diseases; and Oxfam, a group of non-governmental organizations from three continents working worldwide to fight poverty and injustice. But it is with Voto Latino, the youth driven organization she co-founded along with Maria Theresa Kumar, where she lets her passion for advocacy run wild. Voto Latino was founded for the purpose of empowering youth to become politically aware, leveraging “…the latest available technologies, celebrity voices, media and street teams to register young Americans to vote.” The organization’s Webby Award-winning web-telenovela La Pasion de la Decision is one of their initiatives. It was directed by Wilmer Valderrama, with Rosario playing his love interest and Tony Plana (Ugly Betty) playing “Papi“. Getting her celebrity friends to help out has been what Rosario does very well. She was able to get producer Norman Lear (All in the Family, Aka Pablo) to produce the first round of PSAs. Voto Latino also produced another web series to get young Latinos to fill out their census forms. The cast included Demi Lovato, Ana Ortiz, Jorge Garcia, and Luis Guzman. Rosario likens the goals of Voto Latino to those of Martin Luther King, Jr., who encouraged young people to actively make an impact in their communities. She believes that it is this new generation of young Latinos who will shape America’s democracy for generations to come. “As people we can move together and have a movement, and movements are long lasting. As a community we are unstoppable,” says Rosario. Bel Hernandez is the publisher of Latin Heat.